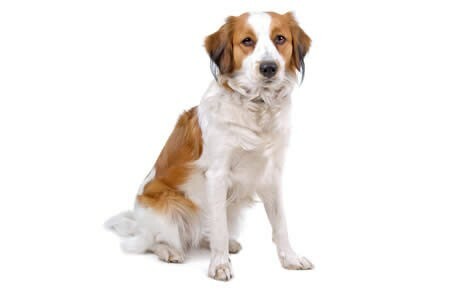 The Kooikerhondje breed originated in Holland back in the 16th century. These dogs are apart of the spaniel family, which means they are excellent hunters and family companions. In fact, back in the day, they were used for luring ducks and hunting vermin. During WWII, Kooikerhondjes were on the brink of extinction, until several supporters made it their mission to save the breed. It wasn’t until the 1900’s that these dogs made it to the United States, and even to this day they are still struggling to gain popularity. While they are not used for hunting and luring, they serve as an excellent household pet that gets along well with both people and animals. The Kooikerhondje can be described as even-tempered, alert, loving, and cheerful. These dogs are people pleasers and will do whatever they can to see a smile on their owner’s face. They can be wary of strangers at first, but after a quick introduction, your Kooikerhondje will show the newbie all the love and attention they deserve. This breed’s intelligence makes them a fun breed to train. As said before, Kooikerhondjes want to please, which means they’ll be ready for any training challenges thrown their way. As long as you start during puppyhood and you have consistent practices, then you should have no issues creating a well-trained and behaved Kooikerhondje. Just like with any breed, it’s important to socialize these dogs as early on as possible. Introduce them to unfamiliar people, places, sounds, and experiences. This will teach them how to have appropriate behavior on a daily basis. Although they are an active breed, the Kooikerhondje does not require hours of exercise. A daily walk or two around the block will be sufficient to keep them happy and healthy. They also adapt very well to different exercise activities. Many Kooikerhondjes enjoy flyball, swimming, agility training, and even a game of fetch. The average lifespan of the Kooikerhondje breed is between 12 to 14 years. The Kooikerhondje has remained an unpopular breed in the United States since their introduction during the 1900’s. While they are not on the AKC’s registered list of official breeds, they have been recognized by the organization in 2004. When creating a proper feeding regimen, it’s important to consider the dog’s size, age, metabolism, and activity level. What you feed your pet can have a significant impact on his overall health. That’s why it’s important to find a dog food that is filled with all-natural and nutritious ingredients. Try to avoid any dog food that lists preservatives, fillers, or byproducts as the main ingredients. Because of their waterproof coat, the Kooikerhondje is a naturally clean breed and doesn’t require a strict grooming regimen. It’s important to brush their coat on a weekly basis in order to keep it fresh and at its best. Professionals recommend brushing their teeth at least once a week to rid the mouth of any bacteria or tartar buildup that may be lurking. Lastly, trim their nails every couple of weeks to avoid breakage or cracking. If you can hear their nails tapping on the hardwood floor, that means it’s time for a trim! Are Kooikerhondje Good with Kids? Their friendly demeanor and medium size make the Kooikerhondje a perfect companion for children. As long as the child knows how to properly care for and treat your pet, there will be no problems with owning this breed. Keep in mind that a parent should always be around to supervise any interactions between a child and pet. Von Willebrand’s Disease: Von Willebrand’s Disease in dogs occurs when the blood is unable to clot how it’s supposed to. Symptoms may include bleeding from the nose or excessive bleeding after surgery. Patellar Luxation: Patellar Luxation in dogs occurs when the kneecap becomes dislocated out of its socket. In severe cases, degenerative arthritis is associated with this condition. Cataracts: Canine cataracts is a common eye condition that affects many dog breeds. This occurs when the lens of the eye becomes clouded over, causing a loss of vision. If total blindness results, corrective surgery may be recommended.